I know I have been a little absent this week, it is not through lack of interesting food by any means. As some of you may remember I bought a catering business with another chef at the end of last year. It is all going well and the stress hasn't killed us yet, so we decided to mess with it a little and find a bigger space with the hope of adding on a cooking school. To cut a long and stressful story short, we found the bigger space, so big in fact we decided to add on a cafe out the front, cooking school in the middle and catering kitchen in the rear. Mad you might be thinking? With that said, my partner and I have been playing around with food ideas, trying to come up with some interesting classes for the folks of Sydney. We will be offering basic cooking classes, specialty classes and also kids' cooking classes but we also wanted to offer something extra- a chef's table for those cooks out there who want a one-on-one personal lesson with a chef. With the Chef's table you can help design your own menu, prepare the meal and then invite 6-8 of your friends to come for dinner and taste your menu. The fun part is you get to go home, pop your glad rags on grab your partner and come out for the dinner you created, leaving the plating and washing up to us. We are excited and can't wait to get the bench tops up and ovens in to get this show on the road! Just to wet your appetite here are a few images we have been playing around with. and we couldn't go past the classic melon and prosciutto with buffalo mozzarella and basil for those warm evenings. Can't you just feel the champagne bubbles tickling your nose! I'll keep you up dated on the progress and hopefully have some images of the glamorous new kitchen really soon. Now you have done it, I find myself a bit envious of you. I have been toying with teaching cooking classes and haven't made the leap. You have congratulations! Love the Chef's table idea how cool. Pictures are great by the way, the Gravlax/Caviar is so beautiful I can almost taste it. Sounds and looks wonderful! I'm a little jealous, too! Thanks Bryan & TKW, what about guest appearances?? I'd love to have you down under....I'll be hounding you once I know what the hell I am actually doing! Just interested to know what the top photograph is ? Could it be apple? 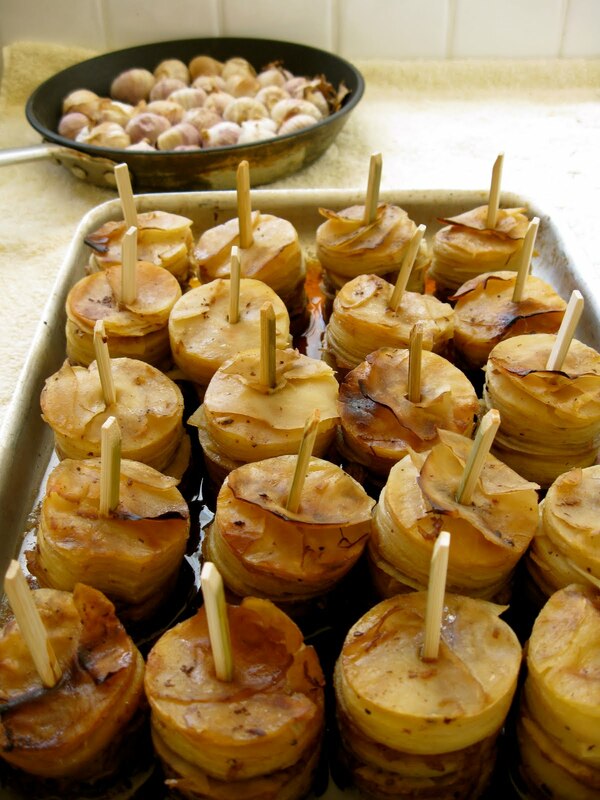 No, it is roasted garlic in the pan and potato stacks cooked in duck fat- really yummy! Love the tomato with avocado and caviar. So elegant and fresh!